ZSQ series belt dewaterer is a new type dewatering equipment specially developed in light of actual need of brewery mash dewatering in brewhouse by successfully absorbing the advanced techniques of pressure filter home and abroad through many years research. It is the best choice for dewatering of wheat beer brewery mash. This equipment has the characteristics as continuous working, good dewatering effects, lower power consumption, lower noisy, easy for operation and maintenance. Its dewatering effect is of the domestic leading level. The equipment mainly consists of (1) main body (brewers grain and dregs dewatering body), (2) air compressor, (3) air source processor, (4) electric control box, (5) screen washing agent filter. The main body mainly consists of stand (1), feed bin (2), filter screen(3), tension device(4), tuningout device(5), driving mechanism(6), scraper discharging device(7), various bearing seats and rollers(8), drainage sink(9), and screen washing device(10). 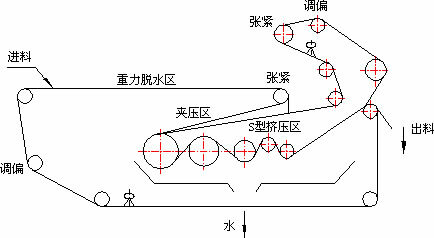 Shown as the following Figure. 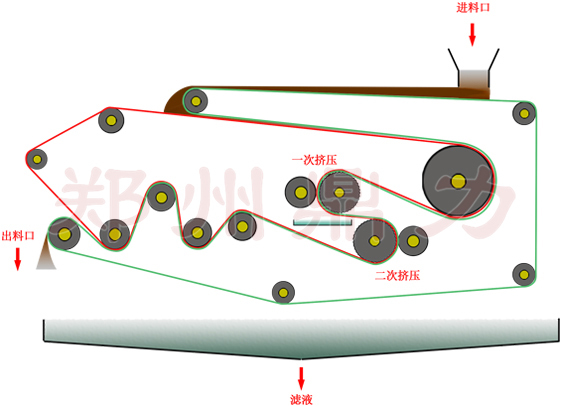 Lay the material to the filter belt through the feed bin, and then press repeatedly through gravity dewatering zone, cramping dewatering zone, and S shape pressing dewatering zone. The water is pressed out and drained out of the sink in the lower part, and the residues after repeated dewatering is discharged by the scraper discharging device.